Synopsis: Introduction to actions that work and how we know they work starts this mini-love-lesson which is then followed by a dozen specific steps you can take that are known to have helped a great many people get through heartbreak recovery and on to full and lasting love. Agony, misery, longing, emptiness, depression, despair, deep and profound hurt – on and on go the words that describe the pain of a broken heart. The good news is you can hurry to ‘heartbreak recovery’ and go on to healthy, real, full and lasting love! In fact you can go on to far better love than perhaps you ever thought possible using your heartbreak to help you get there. To do heartbreak recovery you have to take action. New actions which are probably rather different from what you are used to will be required. New behaviors, new thinking and even new emotions may be involved. To achieve heartbreak recovery and going on to full and lasting love requires some time, will, energy, learning, practice and real effort. The only thing taking more of these things is not acting to recover. Important: ‘if you want better results you have to DO better actions’. The same old actions will only get you the same old results. We will show you actions that are known to have brought heartbreak recovery too many. They also can help you move on to healthy, real love and its wondrous joys. You have to take the actions which begins with reading about them here. You already have begun. How Do We Know These Actions Actually Work? I know these heartbreak recovery actions work because of three big things. First, I personally have had the profound joy of seeing literally hundreds of heartbroken, suffering individuals and couples achieve heartbreak recovery and go on to healthy, real love by using the techniques you are soon to read about. The same is true for the counselors and therapists I have trained, coached and supervised. Second is that many of the methods suggested here are backed by some pretty good, supporting, scientific research. (Consult Is There Really a New Field Called Loveology?). 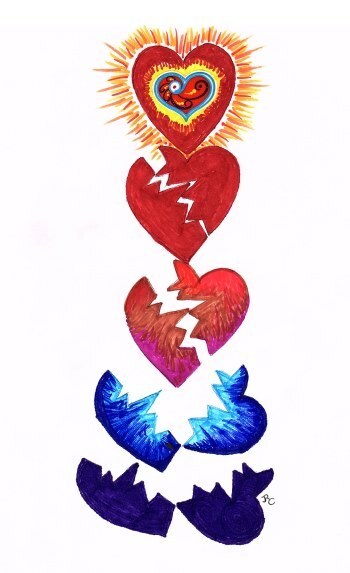 The third is that when I was going through heartbreak and desperately in need of heartbreak recovery I used a number of these techniques and they made a world of positive difference. They also helped me go on to my now 40 + years of grand and abiding love with my wondrous lover, Kathleen. We only have room to briefly describe the actions we are suggesting you take. It is OK if you are dubious about some of them and whether or not they will work for you. The suggested actions for heartbreak recovery and going on to full of lasting love are not things you have to believe in, though that might help some. They just are things you have to actually do experimentally but not halfheartedly. Trying them on for size, so to speak, will be just fine. Also you do not have to do all of them. We suggest you pick out some of the ones that seem to appeal to you and start with those. Then, keep going on to others and keep repeating the ones that seem to work best until you are where you want to be. 1. Vow to recover! With power and vigor, decide and declare your decision to recover, to heal and to go on to greater love. Do this out loud and with muscular, physical motions. ‘Motion changes emotion’ so as you make your declaration (without self hurt) pound your fist , stomp, march or do whatever helps you feel powerful. By doing it this way you reach much deeper into your mind/brain where simple reason and non-energized speech seldom reaches. With determination ‘promise’ yourself you will do what it takes! 2. Start being better to your body. Accept the fact that emotional heartbreak is biologically bad for your body and especially bad for your brain. Heartbreak sometimes precipitates physical heart attacks, immunity problems, depression, anxiety episodes, stress reactions, stomach problems, and a lot more problems you do not want. So, if it is healthy for you, take vitamins, eat healthy, exercise at least 20 minutes a day and consider being guided by the health professionals of your choice. 3. Hide in your safety cave, but not too long. When wounded, most animals including us humans want to crawl in a hole and stay there. That is a natural way to stay safe and start the healing process. Doing this will help you survive but will not help you thrive. So, before you feel fully ready, start venturing out a little bit at a time and then more and more. 4. Use the pain! Hurt has purpose. It exists to help us avoid harm. It comes with ‘guidance messages’ and for those who learn how to hear what it is trying to say and trying to teach us, recovery comes sooner and better. Often when we learn and start to follow the guidance from emotional pain the pain surprisingly reduces. Denying the hurt, running away from it, ‘toughing it out’, over medicating, drowning it in alcohol and drugs, etc., in the long run, may prolong the pain, make it worse and help you experience heartbreak again because probably you didn’t learn enough from it (See Title Index ‘Dealing with Love Hurts:’alphabetically, first 4 lessons). 5. Actively release anger – nondestructively. On at least three separate occasions scream, cuss, pound your fist, stomp around, kick pillows, chop wood, tear up stuff you were going to throw way, throw ice cubes at brick walls, cry freely and generally thrash about for no more than 20 minutes (less if physically need be, or if the anger feels diminished earlier). Then force yourself to do something else that feels good. Cathartic release has real value but there is a danger. If you do it too much you may be training yourself to have more pain, anger, etc.. Be sure you do all this in ways that do not hurt or harm anyone, including yourself or damages anything of importance. Vengeance fantasies are fine but vengeance actions lead us away from future love success, not toward it. “Vengeance is mine saith the Lord” probably because humans can not handle it. 6. Fake it till you make it. When you fake being okay, happy, doing well, etc. you actually trigger mechanisms in your brain that helps it become more true. So, not just when you are around others but also when you are by yourself, smile, sing, whistle, say happy upbeat stuff to yourself about yourself, and act like your heartbreak recovery has been fully achieved. 7. Use the ‘five titles technique’. If you are pining away, can not stop trying to restart the relationship even though you know it won’t work, torturing yourself with longing, etc., this technique is for you. Purposely think of the five worst things that happened in that relationship. Give each of those five things a book or movie title. For example, “She was brought home by police, and was so drunk she was almost arrested for lewd, disorderly conduct – titled Days of Wine and Roses” or “He knocked me down and broke my wrist – titled The Abuser” Write each title on a card you carry with you. When you get to longing, etc., take out the card and read the first title while asking yourself “Do I really want to risk suffering through another version of that again?” Do the same with title 2, and so forth. Then go do something distracting possibly with a friend. 8. Emotionally diminish and detox contact with your ex. Contact with an ex can work like an addict having another dose of heroin as they try to withdraw. Each contact can start the addiction dynamics all over again. If you work together or have to do parenting together, etc. it is extra hard but there is a way. With each contact, act as emotionally blah, boring, dull and businesslike as you can. Any show of emotion, be it positive or negative, may start the addiction-like process all over again. No matter what your ex does, the more you do not show emotions the less negatively emotionally effected you are likely to be. This likely also will help your ex to contact you less often and in less negative way’s. Continue this demeanor until your breakup recovery is well established. Later a ‘kill’em’ with kindness” approach may help. Having zero contact can be rough and it can work like going ‘cold turkey’ but it is likely to be the quickest route to full heartbreak recovery. Weaning yourself with less and less, and shorter and shorter contacts also can work but may take longer. If your ex is trying to hurt or harass you, this approach often can help get your ex confused, disinterested and disengaged. 9. Learn about and practice healthy self-love a lot. Especially is it important to make your self-talk accurately positive. If your self-talk is too negative and critical, heartbreak recovery will probably take a lot longer. So, start making your list of ‘one hundred good things about yourself’ – small, medium and large things. Pick a few each day to compliment and praise yourself about. Do this with gusto and physical motions expressive of strength. This will help reach the limbic system of your brain and not just stay in the more shallow, unmotivating, thinking cortex; by doing that it can help a lot. Do yourself favors, buy yourself presents, do things that help you laugh and put yourself with upbeat people. Listen to happy music. Do upbeat meditation and/or prayer. Re-affirm your loveability and your ability to love as you learn more and more about love (See “Self-love and Its Five Healthy Functions”). 10. Don’t stagnate, meditate then activate. You may need some ‘down time’, quiet time, etc. Use it well meditating, celebrating the good that was in the last relationship and how it will be a prerequisite for what comes next. Journal what you have yet to learn and to strengthen in yourself. Then push yourself into new action. Go new places and meet new, up beat and going people, avoid the old and the sad connected to your ex, envision the future you want and go after it knowing you can grow more love-skilled to get it, renounce remorse, guilt, blame and focus on being response-‘able’. Engage in joyful and meaningful spiritual practices. Start creating new positive memories, new positive habits and new positive goals. 11. Start flirting and then dating ‘lite’ and not just one. You may not be ready to do this until you after you have done it. Very important is not to center in on the first romantic love possibility and exclude others. Go out with 2 or more, even five, but maybe after that it gets too complicated. Don’t get serious maybe for at least a year. The best potential romantic interest is likely to slowly rise above the others. Don’t get in a rush or let yourself be rushed. Remember, real love is patient and most things that grow slower grow stronger and last longer. 12. Study love and its workings, and practice what you learn. This is the most important one of all. You may have to break free from the old, destructive myth that teaches us to rely on magic and fate for our success at love. It subtly teaches there is nothing to learn or work at. Love, like everything else important done without learning and work, is extremely failure prone. Notice that in the ancient legends the masters of magic, wizards and sorcerers spent most of their time studying and practicing. If you are to experience the magical wonders of love, you probably will have to do the same – study and practice a lot (Read “To Win at Love Study Love”). More and more scientific researchers are delving into the dynamics of love and what they are finding is marvelous, beautiful, fantastic and most of all is useful. These findings show love to be even more amazing and far more important for life’s well-being than we ever thought. In Russia, Loveology (read “Is There Really a New Field Called Loveology” has been made an official field of study. You already are at work studying love by reading this mini-love-lesson. Next, I recommend you read the mini-love-lesson titled “To Win at Love Study Love”. It tells ways to study love and gives recommendations for reading that have helped millions. Then read a few more mini-love-lessons from the index section called Definitions, Theories and Understandings. Also be sure to check out “Heartbreak Mending and the Deep, Multi-love Remedy”, “Why Love Problems Hurt so Bad” and “Loneliness and Love” in the Problems and Pain section. But remember, you can’t just read about love, you have to do things, new and different things because love is a participation endeavor. It is kind of like swimming, just reading and thinking about it won’t be enough. Consequently, frequently it is the study and practice of love knowledge that can get you through heartbreak, to recovery and on to full and lasting love much faster and much more thoroughly. ♥ Love Success Questions: Which of the above 12 steps for heartbreak recovery are you going to start experimenting with first, and exactly how soon are you going to start? ♥ And could this mini-love-lesson be of help to someone you know who is suffer from heartbreak? If so, please tell them about it.